Throughout Virginia, spot are usually available in the surf from late summer through early fall. 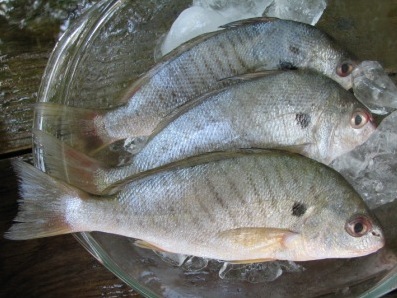 These delicious saltwater fish are a favorite among surf fishermen for food and as fishing bait. Spot arrive in the surf early as June but the best runs usually start around Labor Day and continue into October. They can be caught close to the breakers and only light tackle is required. Spot are bait stealers but can be caught using small pieces of bait and small hooks. Bloodworms are by far the most effective bait, although squid, peeler crabs, clams and scented baits such as fish bites are also effective in the surf. When targeting spot, anglers usually fish small, two hook, surf float rigs on light to medium action surf rods. Some anglers release spot or keep them for the table. Another popular technique is to fish 2 setups. When a spot is caught, it is rigged whole or cut and casted out beyond the breakers as bait for red drum, seatrout, striped bass, bluefish, sharks or other species. Excess spot can be brined and frozen for later use. Spot kept for the table are usually scaled, rinsed, and carefully filleted or simply headed and gutted. Prior to cooking, spot should be refrigerated and soaked in water with a dash of sea salt. Fillets or cleaned fish should be rinsed and drained thoroughly before breading. Dredge each piece in egg and then coat with flour, corn meal, or a seafood breading mix. Spot is delicious fried in hot peanut oil until lightly browned and served hot with seasonal side dishes.